We Value and Reward Your Feedback! As our thanks to you for dropping us a nice note about our services, referring us to friends, family and co-workers or for shooting a raving fan video, we want to give you a chance for something in return. We will automatically enroll you into our twice yearly giveaway of a new bicycle or flat screen TV. You can even hedge the odds in your favor as we don’t put a cap on your entries. Heck, how could we tell you to stop singing our praises to your friends and family? New to this ongoing reward program is a cool way to directly provide us your feedback about our services and easily rate us without making it too difficult. Because you’re busy and don’t need extra steps to take or hoops to jump through. Once you are on the site, your name, e-mail address and 3 brief check mark questions will be asked. There is space available to write of your service or installation experience in your own words. Of course, if for some reason you are not happy with something or have any issues – you can also use this form to get to the owners – us – directly. We have always been happy to address each and every concern and to work towards an amicable resolution. Our goal is always to have few and further between negative instances! 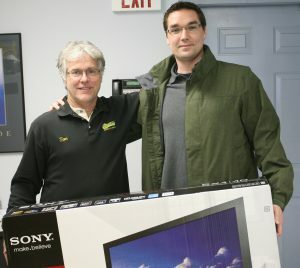 Our latest winner in the drawing was Brian from CaptiveAire shown in the photo alongside his new TV set. Had he or anyone else (maybe YOU next time) picked the bicycle – no worries. We would have and will be happy to work along with the winner and their favorite local bike shop directly to get their prize. Besides the feedback link shown, don’t forget you will automatically be entered after one of your testimonials or referrals. Don’t like changes? As always, you can continue to enter by mail, e-mail or phone. Good luck. Tom Corcoran John Corcoran Brenda M. Mike W. Greg J. Thomas L. Paul S.
Your Message - Any comments you have about a job well done or where to improve. Telling others gets you the same benefits listed above! Not always the best service to have done, but when you are happy with it, the service must have been GREAT. I have to commend Tom (he worked on my home and business), he was very courteous and very knowledgeable. He even took the time to explain everything he was doing for me. I'll be using these guys in the future for maintenance and any service. THANK YOU! Its great to find a Family owned company that offers such great service from the first call to the maintenance appointments! John has offered me valuable advice which has kept my furnace running smoothly for years. Every HVAC technician they sent has been friendly and professional. I would never call anyone else for my heating repair needs. Thanks for being Great! We have used Corcoran Heating & A/C for at least 20 years. Their service is always excellent and if they are not sure of what is causing the problem, they admit it and research the problem and resolve it. With the addition of Tom's son John to the business, they have really upped their game and I believe they are now out front of their competition not only in service but in the latest technology related to their business. I have and will continue to recommend Corcoran Heating & A/C to others. I just wanted to take moment an express my sincere gratitude and appreciation towards you and your company. As you know we had (2) two five year old Peerless Pinacle boiler at my home that we had lost all confidence in, and of course during the Christmas/New Year holiday break we had no heat. From the moment you call me to the day long service call to the installation of the new peerless boiler. You and your men were nothing less than spectacular. It was your professionalism and truly caring attitude that made a frustrating situation so much easier to deal with.Every aspect of your company was of the utmost care and professionalism. From your relentlessness attitude in trying to repair the existing boiler, to the prompt professional courtesy that your men showed my family during the installation of the new boiler. As per your advice, we took out both boilers and replaced them with one larger newer version of the Peerless boiler. I wanted you to know that your advice was dead on correct! !The new boiler is working great, heating the home perfectly, extremely quit and extremely efficiently. So needless to say you are my new best friend. Please let this letter serve as notice that I will be recommending your company to EVERYONE I KNOW! !It is a truly comforting feeling to know that there are still people and companies out there that put their client’s feelings and concerns before the almighty dollar. I’m a big believer in life “That what goes around comes around” and if you treat people right it comes back ten fold. Please feel free to use my name as a proud referral for your company! Good service and trustworthy. I have the regular maintenance program and am very happy. They tune up the furnace in the fall and AC in the spring. Keep the house running! Highly recommend. Awesome Family Owned Company. Fixed a vent issue I have been putting up with since I bought the house. Looked at my furnace and vents and now my house is warmer and the heat kicks on less which I'm going to assume will save me money. I actually retired the space heater! Tom the owner also saw an issue with my water heater and carbon monoxide after he packed his gear up, and insisted that he fix the issue for my families safety. Charged me more then a fair price and possibly saved my life? Give Corcoran Heating a Call! They give you a much more personalized service then these national franchises . Couldn't be Happier!